By permission of Down Beat magazine come these photos of some of the most famous jazz musicians of the Swing era. Left click on photos to enlarge. NOTICE: All images of the famous jazz musicians contained herein should be considered copyrighted material. Downloading photos from this site, either in part or in whole, without the expressed permission of the Webmaster is strictly prohibited. Unauthorized use, distribution or duplication of any image will result in swift legal action. 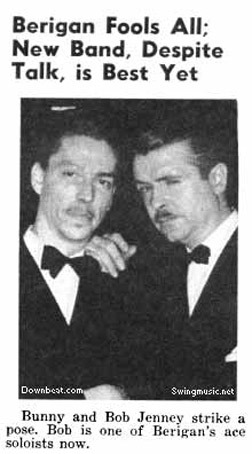 Jazz trumpet legend Bunny Berigan (r) was highly individualistic in both lifestyle and jazz style. Berigan left a steady gig as a sideman in Tommy Dorsey's big band to form his own outfit in 1937. Sadly, Berigan was not adept at handling finances or managing a big band and filed bankruptcy before returning to the Dorsey fold in 1940. Sidemen who passed through Berigan's band included Buddy Rich, Georgie Auld, Ray Conniff, and Dave Tough. Bunny is pictured here with one of his sidemen, trombonist Bob Jenney. 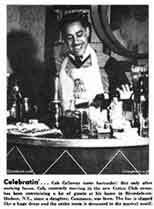 His highness of hep, Cab Calloway serves up some groove juice at his posh apartment in New York. Note the bar shaped like a drum. Although some considered him a novelty act, due to his antics as an entertainer and his Hi-De-Ho-ing, his voice had bell-like clarity. He was a big draw at the Cotton Club in Harlem in the early 1930s and went on to lead a successful band during the Big Band era. Calloway employed some of the finest jazz musicians in the business during the Big Band era including Dizzy Gillespie, Chu Berry, Cozy Cole, Milt Hinton, Jonah Jones and Illinois Jacquet. 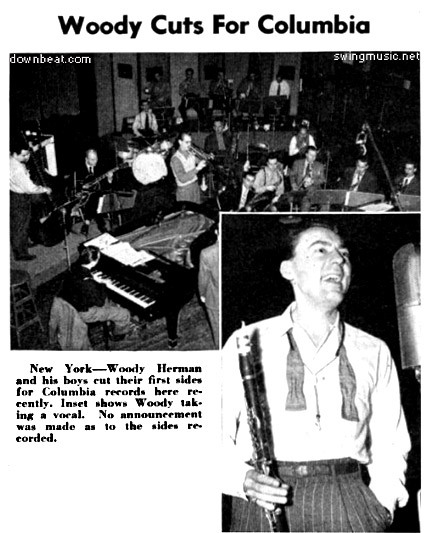 Woody Herman had been a big band-leader since 1936 when his first band, The Band That Plays The Blues, recorded some great sides for Decca. 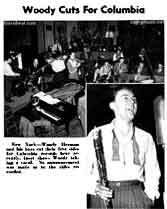 His first Columbia sessions took place in February 1945 with a band that became known as The First Herd. 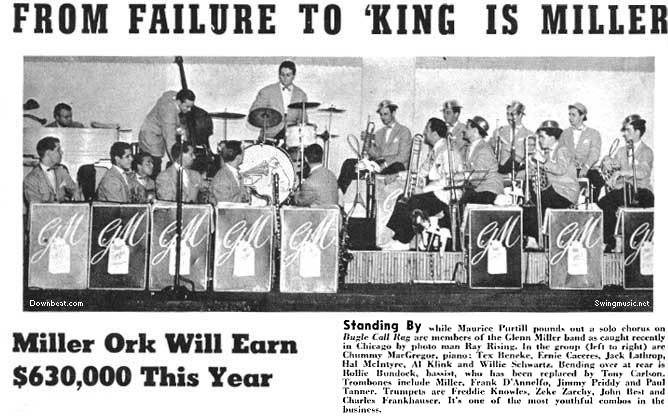 The group garnered "Best Swing Band" honors in the 1945 Down Beat poll and cut many great big band jazz sides like Northwest Passage, Your Father's Mustache and Apple Honey. This band predated the Four Brothers Band by about two years and contained Chubby Jackson, Pete Candoli, Billy Bauer and others. Jazz drummer Cozy Cole (l) and jazz trumpeter Jonah Jones (r) in 1938. At this time both were employed by jazz violinist Stuff Smith and part of his Onyx Club Boys. 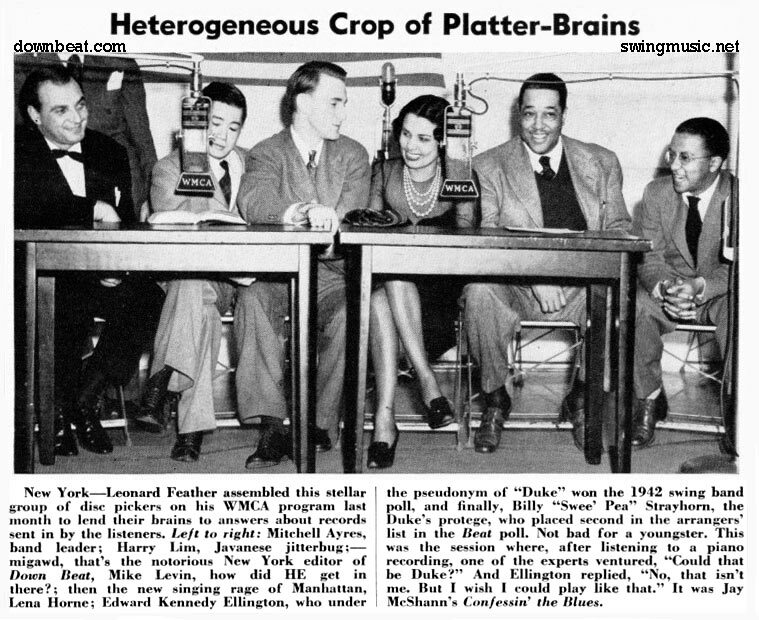 The two had moonlighted on a Lionel Hampton session together in 1937 and on a Billie Holiday date with Teddy Wilson and others in July of 1938. 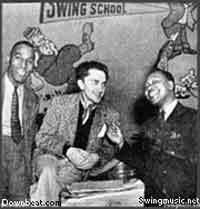 They were both later hired by Cab Calloway and became part of his big band swing outfit. "Jonah joined the Cab" in 1941; Cozy Cole went to the Calloway big band in February of 1939. These were three of the public's favorite band-leaders during the Big Band era. 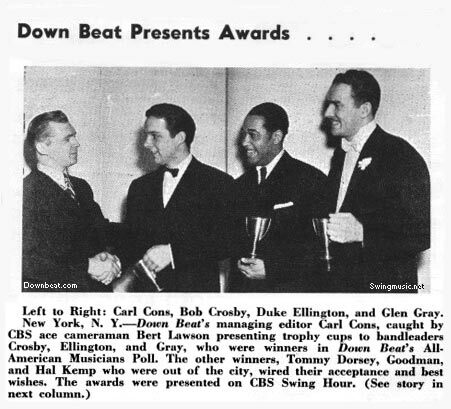 From right is Glen Gray, big band-leader of the Casa Loma Orchestra; the maestro, Duke Ellington; and Bob Crosby who lead a Dixie style band. 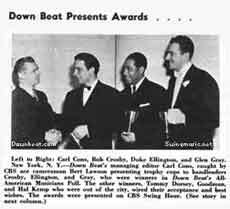 All are accepting awards in early 1940 having won Down Beat's All American Musicians Poll. Down Beat ran reader polls annually wherein it's readers voted for their favorite jazz musicians. Metronome magazine conducted a similar yearly poll. 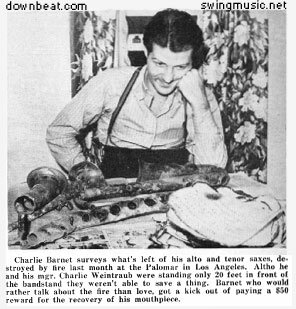 Charlie Barnet after a fire at the Palomar Ballroom had consumed his big band's instruments and arrangements on the night of October 2nd, 1939. Not one to brood, Barnet promptly recorded the tune Are We Burnt Up. The record was unreleased but later became Leapin At The Lincoln without the lyric of, "are we burnt up....oh Palomar, oh Palomar." Count Basie was the first jazz musician and band-leader to offer Barnet his music charts. Basie was to follow Barnet into the famous ballroom. 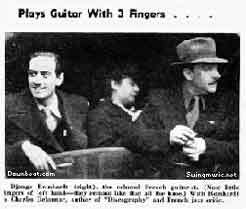 One of the greatest jazz guitarists of all time, the Belgium gypsy, Django Reinhardt is on the right. French jazz impresario Charles Delaunay is with Reinhardt. Delaunay wrote one of the first jazz reference books to detail jazz records. The New Hot Jazz Discography was first published in 1938. The book detailed jazz recordings by label and date, also listing which jazz musicians were present and which instrument they played. 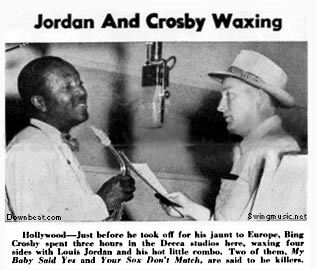 Louis Jordan and Bing Crosby in a recording session that produced four sides in 1944. "Old Groaner," as Crosby was later called,was a jazz lover at heart. "Der Bingle" also recorded with jazz musicians Lionel Hampton, Louis Armstrong and others. In 1930, Bing's first vocal group, The Rhythm Boys waxed sides with Duke Ellington and Bix Beiderbecke. Louis Jordan became a big success after leaving Chick Webb's band in 1938. Rate-a-record radio programs were popular on both coasts during the Swing era. Typically the hosts would have one or two jazz musicians or critics on hand to give their opinions on the swing music disc being played. 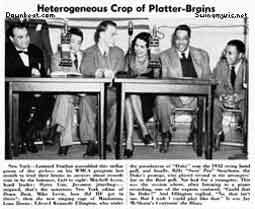 This particular show aired on WMCA in 1945 and included Duke Ellington, his young collaborator Billy Strayhorn, and the vivacious Lena Horne. Also pictured is Harry Lim, who oversaw some great sessions for Keynote records. A band that received high accolades from Down Beat for playing great jazz, but never went over with the public, was Harlan Leonard And His Rockets. 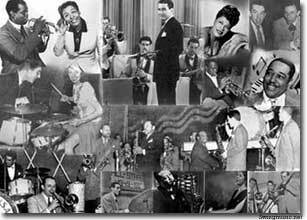 The band recorded about 20 sides during the Big Band era in 1940 and then drifted off into obscurity. This was one of four superb big bands to come out of K.C; the other three were the big bands of Count Basie, Andy Kirk, and Jay McShann. 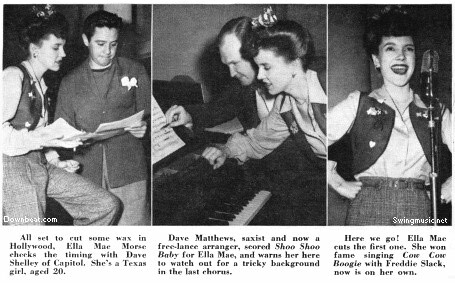 Jazz vocalist Ella Mae Morse, a solo act after big records with Freddie Slack, waxes for Capitol in 1943. This session, near the end of the Big Band era, just after the ill-fated Petrillo recording ban, produced a big hit record during WWII called Shoo Shoo Baby. Capitol was one of the first labels to settle with the union. Glenn Miller's success as a big band-leader did not come overnight. Miller had an outfit in 1937 that flopped. He formed another big band in 1938 that, by 1939, reached phenomenal heights of popularity. 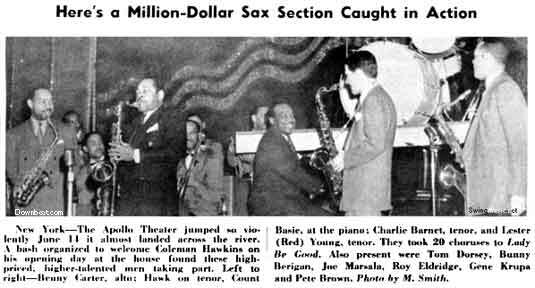 This picture, in the 6-40 Down Beat, included several articles about the band, touting its brand of big band jazz.